You may feel as though you have your back against the wall today as you struggle to maintain your principles. This could relate to something you strongly believe in, such as a political or religious stance. If so, you may feel attacked by others and forced to defend your views. It can also be an altercation that’s been in the making for some time; the culmination of “bad blood” that’s been bubbling to the surface and finally comes to a head. Either way you are going to feel the need to stand up for yourself, even if it means angering someone else in the process. You may feel attacked or ganged up on and will have to reconcile a “me against the world” attitude before it turns into a chip on your shoulder. 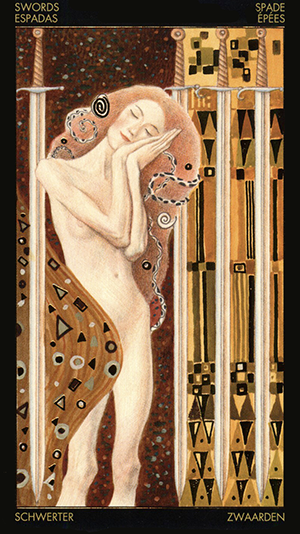 The Seven of Wands — this version from the gorgeous Golden Tarot of Klimt — also refers to a need to be more alert, guarded and cautious, rather than accepting things at face value. This is not the time to rest on your laurels. You’ll want to be braced for attack as your views are more than likely going to rub some people the wrong way. This doesn’t mean you need to be aggressive or combative. It’s actually just the opposite. You need to adopt a defensive posture in order to deflect the daggers that will more than likely be flung your way. As Uranus officially turns retrograde in Aries today you may see many ideas presenting themselves in a whole new light, along with the means to accomplish them. If you have been having a hard time putting your skills to the test at work or with something you are wishing to build this is the time you find that everything falls into place for you. You have the energy, drive and ambition to reach your goals all you need is to take that first step to launch in the direction you wish to find yourself. By being practical and following your heart you can shed that which is not working for you and take on a whole new persona in relation to your work. 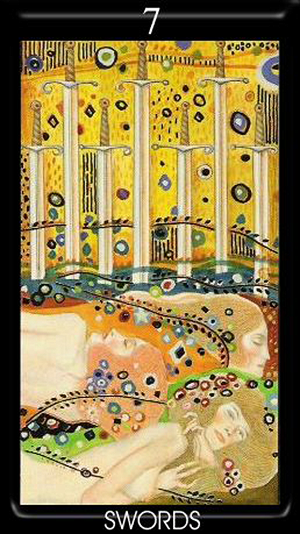 The colors on this card — this version from the Golden Tarot of Klimt — give an idea as to the attributes which surround you. The brown background keeps you stable and practical, the red on the dress shows determination and action, and the yellows represent the ideas that you have. Notice the snake curling around the right arm as if something is consciously being shed and changed in order to tune into what you wish to accomplish. This is in keeping with Uranus’s retrograde motion, which implores you to retrace some of your earlier steps. Even the snakes head dips into a bowl held in the left hand (representing intuition and ideas). This Magician card ties in beautifully with the Venus retrograde as well — encourages you to use your head to access your own brilliance and originality (Uranus retrograde) without sacrificing your heart (Venus retrograde). The images in this card reminds you to make the most of both. Depending on where in the world you live, today marks the Cancer New Moon (at 00:24 Universal time). This is an interesting New Moon as it falls between two Full Moons this month: the first one July 2nd and the second one — a “blue moon” on the 31st. You may be feeling confused or uncertain about something and want to get to the bottom of a matter that is not clear. As the Moon card is often associated with deception, you want to take care not to get caught up in other people’s disillusionment, or for that matter even your own. This is a good time to step back and take a deep breath in order to understand and clarify where “you” are within a situation and to not take things on face value. A dream is a dream until it becomes reality and the problem with this card is that if you are not well focused on where you stand and allow someone else to call the shots you may end up in a nightmare. You have the power to control your own destiny. See through the lies and deceit and decide for yourself what is best for you. 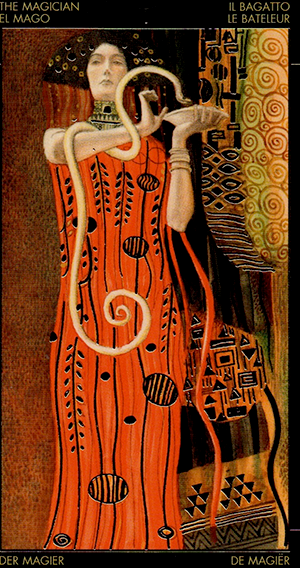 The woman in this card — from the Golden Tarot of Klimt. — sleeps peacefully floating around within a galaxy of stars, planets and moons. What is she dreaming about? How long has she been dreaming? The look on her face is serene as if she is happy just to float on and on in a never ending dream world. When she wakes from her slumber she may find that the dream is nothing like the reality around her. Keep this in mind today as you work to decipher what is real and what is just an illusion around you. Usually you find yourself getting pulled back into the situation going against all the logic you have used in getting away from it in the first place. Sound familiar? Swords stand for thoughts and here it is your thoughts rather than your emotions that are pulling you back. 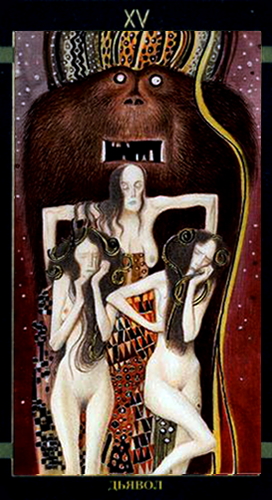 The images of the three women in this card show different thought processes which are going on in relation to the actions you would like to take. Sometimes you may feel like just sitting back and doing nothing, sometimes you feel like going with the flow, and other times you want to get up and take a stand. Only you will know what is right for you when the time comes. Take some time today to think about the options before you. 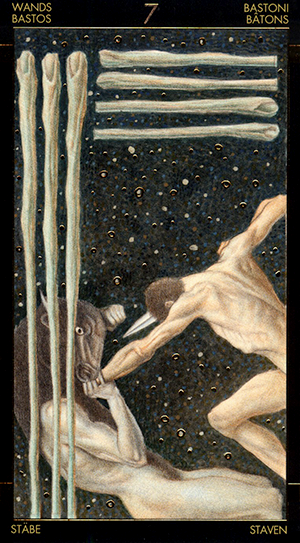 The Seven of Swords is a strategy card, among other things. It won’t do for you to jump up and take action without considering all the possibilities. But if you hold back and deliberate, you are bound to come up with a solution to even the most harrowing dilemma. Things may be speeding up for you just now with many things happening all at once and you caught in the middle of it not knowing what to do first. You may even wish there were more than one of you or an extra set of hands to get all that needs to be accomplished done. Unexpected news is on the horizon so if you’re waiting for a phone call, email, letter, etc expect it to land in your hands soon. 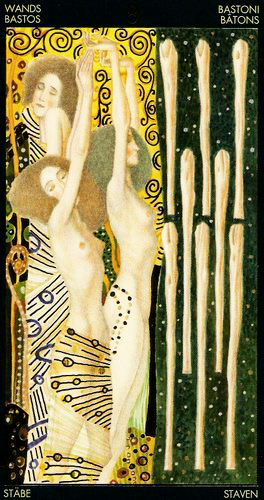 You may even find there is cause for rejoicing at the news as the Eight of Wands — this version from the beautiful Golden Tarot of Klimt — also implies growth. Be prepared for a change and make sure you are ready for it when it does come. Ask yourself what is your attitude to change? Do you embrace it or shy away from it? Do you celebrate the changes in your life and throw yourself into them wholeheartedly or do you shrink away in fear? Do you see the Eight Wands in this card as barriers or do you see them as challenges that need to be vigorously pursued? 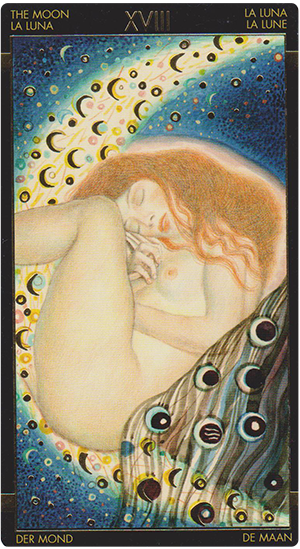 The Eight of Wands implies that change is upon you whether you like it or not. You may not even be given any warning it is about to come so you best be ready for anything. Remember there’s always a reason for change — even if the reason is not clear to you now! The women in this card show the various reactions to the news and changes around them. One looks hesitant whilst two dance in celebration and ready to embrace the changes given to them. The attitude of the two dancing in celebration is the one you want to adopt. Open your arms (and your heart) to the unknown as there are bound to be blessings awaiting you on the other side! There is something going on for you just now that you may be feeling a little stuck in. Well more than a little stuck in as it is the type of situation you feel you cannot escape from, at least not smoothly or without emotional pain and turmoil. With Pluto in opposition to the Sun today there is a certain degree of opposing forces coming into play. Pluto is currently in Capricorn which is a sign known for keeping things orderly. Not that it is a bad thing that Pluto is there because Capricorn is also a sign known for its tenacious and its ability to get things done … a quality Pluto is also famous for. However, bring the Sun into the mix and you have your ego coming into play and you are possibly feeling as if you are drawn in a direction you do not wish to go. It may be best to try to sit this day on the outskirts of anything that requires you to make any decision that you are not comfortable with but ties you into something you would find difficult to extract yourself from in the future. Whether this be a mental, emotional or physical situation for you it is not healthy to felt so caught up in something that it overshadows other areas of yourself and your life. As Venus moves into Pisces today — where it is exalted — you may be thinking about the kind of romantic idealistic love that seems only attainable under the rarest of circumstances. The Lovers card is actually associated with Gemini (which is where the Moon is today). But the painting that was selected for this version of the card is decidedly Venus in Pisces, with the lovers so entwined in an intimate embrace that they appear to almost dissolve into one another. 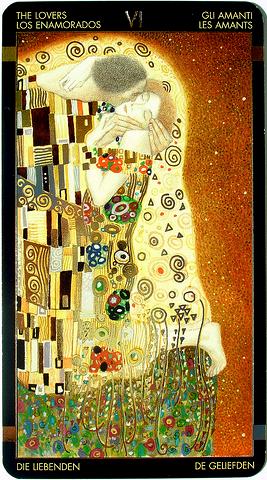 This painting, known as “the Kiss,” is probably Klimt’s most famous piece. It is believed that he and his muse Emilie Flöge were the models for this painting. The Loves card often refers to a decision or a dilemma involving matters of the heart. Perhaps you’re wondering where you stand in a relationship; or maybe you’re questioning your feelings about another. This card also sometimes refers to a literal love triangle. An illicit affair. A clandestine relationship. Or one that would be frowned upon by your family, friends or church. You may be torn about whether to proceed with a relationship that’s still new. Or you may be considering throwing the towel in on one that has grown stale and old. Today it’s all about building upon what you already have and making it work for you. 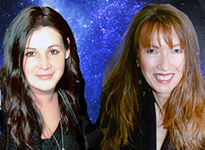 It is an excellent time to make a career move and if you are thinking of doing so then aim high! The road before you is smooth and even with, perhaps, more options than you think. Look for new areas of growth that can further your advancement but may not be obvious when you first look at the options laid out in front of you. There is a solid and familiar feel to what you are aiming for and as you move towards it your dreams and ambitions become clearer. The 10 of pentacles is beautifully depicted in this card with the path (the journey) leading up to the grand building (the destination) in a clear, smooth path. Overlapping across the path are branches of trees bursting with new growth (new ideas). Be open to what comes to you and your path will be smooth towards your ultimate goal. This month is about building upon what you already have and making it work for you. It is an excellent time to make a career move and if you are thinking of doing so then aim high! 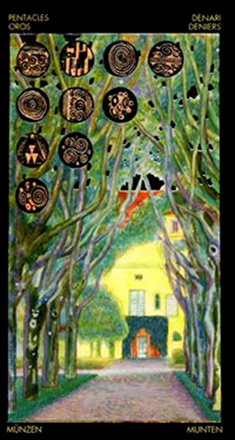 The 10 pentacles is beautifully depicted in this card with the path (the journey) leading up to the grand building (the destination) in a clear, smooth path.